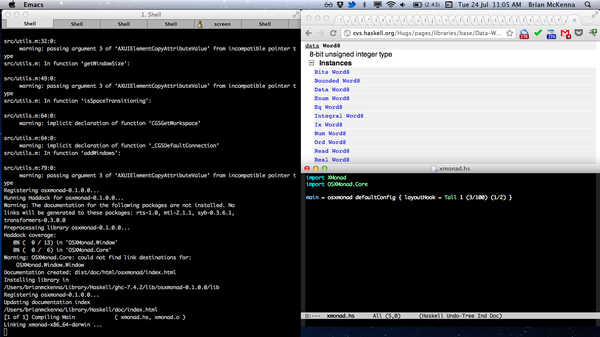 This week I managed to get OSXMonad running as an XMonad library. Which means that when you press "⌥-⌘-a" then "Test" will be printed to the command line. It's a start. But I needed to to be compiled with -framework Cocoa for my Cocoa calls to be linked correctly. I just hard-coded the change and added a Darcs patch to the OSXMonad repo. I'll eventually turn it into a patch to allow additional GHC flags to be given to the xmonad binary. I've added a README for anyone interested in getting started.